Review Last year, Mark Shuttleworth christened Ubuntu 11.04 "Natty Narwhal", saying the disto would be stylish and create a good, lasting first impression. While its debut in beta form is smart looking and definitely chases the fashion in operating-system design it's also the single worst beta release of Ubuntu I've ever tested. That's not to say there isn't much to love in Ubuntu 11.04 with the new Unity Interface being the primary news, but even for a beta this release is way too rough. Unity - regardless of what you think of it - isn't ready for prime time and it seems unlikely Canonical will iron out all its problems before the planned final release in April. Bugs can be fixed, and there are numerous bugs to fix in this release of Unity, but the larger problem is that Unity, thus far, lacks the functionality of GNOME 2.32. Ubuntu, and its users, would be better served if Unity were not the default desktop for this release. Unity is a radical departure, but no less so than GNOME 3.0, which has wisely been pushed back until later this year. The problem isn't that everything you know and love about GNOME is suddenly gone, and Ubuntu 11.04 is, for all intents and purposes a completely different experience than everything that came before it. The real problem is that Unity can't do half of what GNOME can do. If that sounds familiar it might be because the same thing happened to KDE users in the move from KDE 3.x to 4.0. Sadly, rather than learn from the KDE 4 backlash, Canonical has decided to soldier on into the Unity future, whether it's ready or not. Spoiler alert: it's not. On the surface Unity looks good. In fact, Unity will most likely one day trump GNOME in many ways - it's noticeably snappier than GNOME, works well at just about any screen resolution and even appears to be designed with touch-based devices in mind. Eventually, come Ubuntu 13.04 or so, Unity will seem like a brilliant move, but the transition is going to be bumpy. The new universal or global menu - which pulls the main menu out of the application window and puts them in the global menu bar - works surprisingly well and is the first of many features that reflect the influence of Apple's user interface designs. It's different, but the global menu is probably the easiest change to adjust to - same menus, new location. Unity's new launcher/dock is another element that closely mirrors what you'll find in OS X, though without much of the polish and functionality built-in to Apple's offering. The dock has some problems and is missing some obvious features, but it's not hard to see how the dock and accompanying search and launcher tools will eventually be a great time saver. The highlight of the current launcher is the plethora of keyboard shortcuts, which let you to launch applications, open file browsers and call up system-wide searching without taking your hands off the keyboard. There are also a few nice touches in the various indicator apps - for example you can simply hover your mouse over the volume indicator and use the scrollwheel to adjust the volume without ever actually clicking anything. The Ubuntu Software Center is similarly improved and now offers user reviews. You can give a star rating, write a short review and even post the review to Twitter thanks to the Gwibber integration. Even better, the Software Center now lets you to try out apps without having to commit to even a temporary installation. 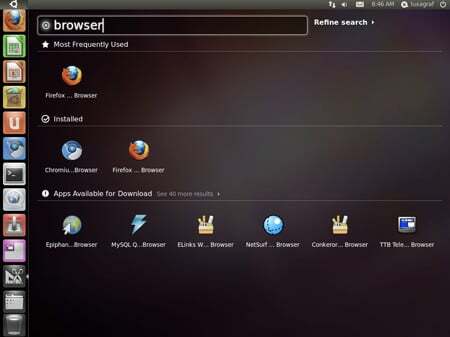 Instead the app is streamed from Ubuntu's servers in a pop-up window. To get the previews working you'll need to install a package by the name of "qtnx." The previews don't seem to work with every app yet, but when they do it will make choosing among the variety of apps available a little bit easier. At times Unity feels awesome, at other times it feels like it was developed specifically to frustrate you into an early grave with a million tiny issues.